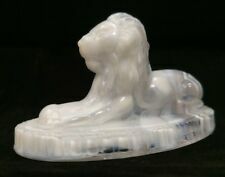 NOS OSCAR the LION PURPLE White MILK SLAG Glass Paperweight Summit MARBLED OOAK! ST CLAIR Summit COBALT BLUE Glass INDIAN Native American TOOTHPICK HOLDER Match! WHITE MILK GLASS Summit Fish DOLPHIN Candy FINIAL Covered KEMPLE Dish OOAK! COBALT BLUE Summit GLASS Fish DOLPHIN Candy FINIAL Covered KEMPLE Dish OOAK! Vintage IMPERIAL Teal ELECTRIC BLUE Glass BIRD CAGE Covered JAR Canister SUMMIT! Lg HEN Split Tail PURPLE Amethyst CARNIVAL Glass WESTMORELAND Chicken HON NEST! WHITE Opalescent MILK Slag GLASS HEN On SLEIGH Nest DISH WESTMORELAND HON NOS! LG Westmoreland PURPLE Milk WHITE Slag Glass Hen HON Nest Dish OOAK Marble NOS!